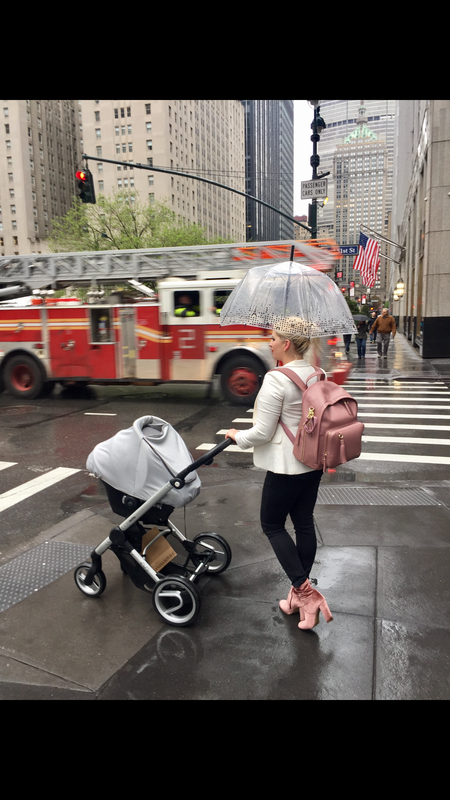 We planned a spontaneous trip to NYC and I started to worry about how I would get around with everything I would need for the day with the baby. In the last week or two I have been eyeing this diaper bag and couldn’t get it out of my mind, so I ordered it with 2 day shipping. We got packed and ready to leave, then I had to come back to the house to get diapers that I forgot to bring with us, and then left the second time, and still no FedEx delivery. I was literally praying for the truck to show up on our street. The truck shows up on our street a block away and we wave the driver to slow down and ask him if he has a delivery for us! So I got my big box and we kept driving to our weekend get away in NYC. After using this bag, I wanted to share some thoughts and give you all a sneak peak, I will update this post with a full review and more detailed pictures in a few days. Let me start out with the fact that I am generally not a fan of diaper bags, at all. The idea is GREAT, I just hate how they all look – I’m a sucker for pretty things and this bag is SO adorable, functional, and large to fit everything! I like having a backpack for traveling and to make it easier if I have my baby in the carrier. My back is always hurting and it’s so much easier having hands free. Large size: for traveling, for mamas with more then one kid – SO MUCH ROOM! Large padded shoulder handles, they are soft and SUPER comfy! Pockets within pockets: the way its organized is simple and allows you to fit everything and find everything easily. Pockets and pockets: the outside pockets are so well positioned and easy to access while holding the baby and having the backpack on your shoulders. Because every mom is multitasking. That hassle: so cute it deserves its own category. Vegan leather: easy to wipe, clean and maintain. It got us through lots of rain. Extra handles to hang on the stroller – visit the website to see an example. Changing pad: I love that its padded, it matches the bag inside color and I don’t have to think to include one! We’ve had lots of questions about this stroller and car seat cover. Scroll down below I included links for both. The stroller is currently on sale. Size: its so roomy that for every day seems too big to carry around, this depends on personal preference and how much you carry with you as a mom. Changing pad doesn’t have a waterproof side to it. It’s still easy to clean and wash but I wish it was easier to clean with just a wipe if there is a mess, and we had one of those messes to clean up after already. I hope that you find this review helpful and enjoy a diaper bag that can be function, fashion all in one! 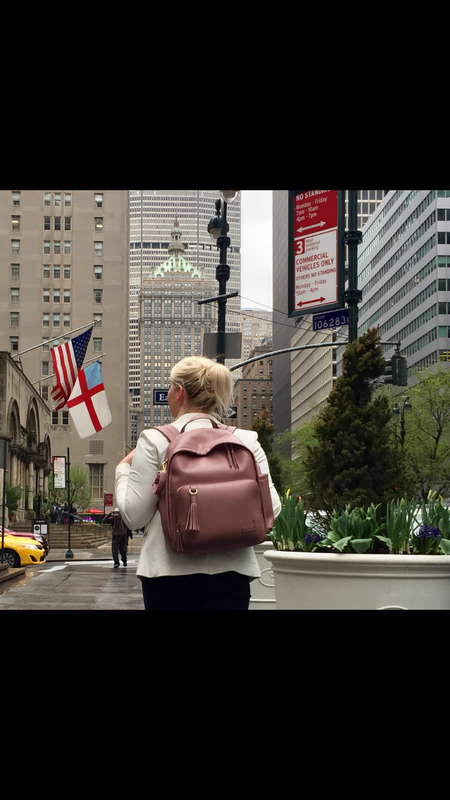 To shop for it click here: Greenwich Diaper Backpack and if you get yours – tag me in it, I want to hear what you think of it and if your review would be similar to mine!